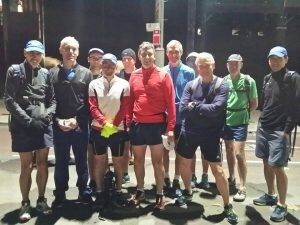 For the second year a group of Trotters went into the Anzac Day Dawn service and ran back to Turramurra. Last year we investigated an Anzac Day Running Event, but it was very expensive and a commercial operation, so we did our own thing. Last year there were four – this year eleven. Richard Duggan, Hideko, Mat Henshall, Rob Thomson, Bart Dekker, Les Bryce, Nick Swan, were joined by a Cycling friend of Rob and a Facebook friend of …Rob, on the 4:09am train to the City. Jon and Lara Fowler drove to the city and Jon ran back with the group. Jaye Chadwick missed the train and drove into the city and amazingly found us in the semi-dark as we were going to leave. Jaye is getting ready to run a Half in the UK in a few weeks time. City Rail provided free trains and coffee, tea and Anzac biscuits at Wynyard. The crowds weren’t as big as last year and the big screens provided a good view of the service, with pictures of soldiers projected onto nearby buildings. The same MC was there, even though last year he said was retiring, and he does an excellent job. The one minute silence was accompanied by all the lights, including the street lights being turned off. The Catafalque party all worn short sleeves on a cold morning and had to remain stationery for some time. I was cold with long sleeves, layers and gloves! 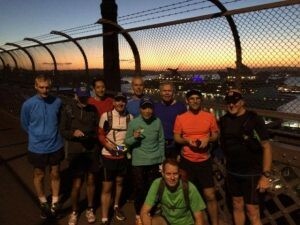 We set off to the Harbour Bridge with Matt doing his usual sprint start in front of everyone. It was a nice pre-dawn view on the Bridge. Everyone set off up the hill to North Sydney, but at St Leonards Bart very wisely pulled out as he had the Flu. On up the highway with Hideko electing to go all the way on the Pacific Highway and the rest following Rob down to the scenic route via the Lane Cove River Park. However the challenge of running up Livingstone Ave to Pymble proved too much for all but Richard and Jon. Everyone then finished at Pierre’s Patisserie on the other side of the Highway, reflecting on the great service and run back home. PS: I had intended to run to St Leonards and catch the train, but in my sleep deprived mind then decided to run to Turramurra – not possible, so I jogged for a while and pushed on walking back.